Orlando, FL – In what has become a very strong partnership, Foxcom, a leading provider of fiber optic transmission solutions, has awarded Multicom, a leading manufacturer and stocking distributor of broadband products, their highest honor: Distributor of the Year. The Foxcom management team brought Sherman Miller, the president of Multicom, to Jerusalem, Israel, to partake in Foxcom’s annual awards ceremony. 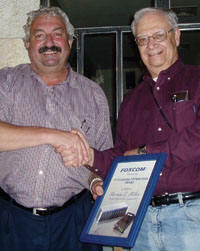 Foxcom CEO Jack Hotz (left) personally handed the award plaque to Sherman (right) after a company safari and dinner.